Oluwatoyin Adewuyi, A. Malnutrition And Its Impacts On The Rural Infants : An Example From Kuje Area Council, Federal Capital Territory-Nigeria. sslej 2019, 4, 1-5. Malnutrition has remained a major issue globally, because of its effects on the social system and health status of citizens and by extension the socio-economic sector. United Nations Children Emergency Fund-UNICEF (2010) 1 defines malnutrition, as a condition that results from eating a diet in which one or more nutrients are either not enough or are too much such that the diet causes health problems. Similarly, World Health Organization-WHO (2018) 2 describes malnutrition as the deficiencies, excesses, or imbalances in a person’s intake of energy and/or nutrients and can manifest in three ways- undernutrition, micronutrient and overweight. Malnutrition, which is also known as undernutrition can lead to deficiencies, excesses, or imbalances in a person’s intake of energy and/or nutrients, while micronutrient is reflected in lack of important vitamins and minerals or micronutrient excess. Overweight can also lead to obesity and diet-related noncommunicable diseases (such as heart disease, stroke, diabetes and some cancers). Poor nutrition can lead to reduced immunity, increased susceptibility to disease, impaired physical and mental development, and reduced productivity. In the same way, adequate, well balanced diet combined with regular physical activity – is a cornerstone of good health. Similarly, Poor nutrition can lead to reduced immunity, increased susceptibility to disease, impaired physical and mental development, and reduced productivity. Infact, WHO (2017) 3 affirmed that, malnutrition remains the gravest single threat to global public health and this according to Bhagat (2017) 4 are associated to lack of balanced diets, indigestible and harmful diet, lack of regulated diet, environment among other. Similarly, Nordqvist (2017) 5 identifies that, low intake of food, mental health problems, social and mobility problems, digestive disorder and stomach problems, alcoholism among others as the causes of malnutrition. Global Nutrition Report (2018) 6 affirms that, every country in the world is suffering from one form of malnutrition or the other. In 2014, WHO (2018) 2 confirms that, globally 1.9billion people were either weight, while in 2018, over 155 million children under the age of 5 years were suffering from stunting, and around 45% of deaths among children under 5 years of age are linked to undernutrition. These mostly occur in low- and middle-income countries. At the same time, in these same countries, rates of childhood overweight and obesity are rising. In Africa, Global Nutrition Report (2018) 6 indicates that, malnutrition is unacceptably high, as it is hardest hit by overlapping forms of malnutrition; this has been linked to unhealthy foods, knowledge and affordability of nutritious food and ineffective food chain supply as some of the factors responsible for malnutrition in Africa. Knowledge of malnutrition is of importance to geographers; it is a means of assessing health status of a people and by extension its effects on socio-economic development of an area. Nigerian Federal Ministry of Health (2014) 7 opines that, knowledge of malnutrition has benefits for individuals, families, and nations; the healthy a society is, the more productive such a society is expected to be. However, Pelletier (1994) affirms that, malnutrition can result in disability, morbidity, and mortality, especially among infants and young children. In Nigeria, Malnutrition is not in any way different from what obtains in other part of Africa; it contributes to nearly half of these deaths and 2 in 5 Nigerian children are stunted, with rates of stunting varying throughout the country 8 . Additionally, the percent of children in Nigeria who are weighted, or too thin for their height, has steadily increased over the last decade, rising from 11 percent in 2003 to 18 percent in 2013 9 . In a survey, MICS (Multiple Cluster Indicator Survey) as cited by 10 puts Nigeria’s stunting rate at 43.3 per cent, as against 32.9 per cent in the 2015 survey. It shows that in 2017, the rate of wasting was 10.8 per cent, while in 2015; the figure was 7.2 per cent. No other record has shown the change the same trend has changed. The study also shows that underweight rate in the country was at 31.5 per cent in 2017, while in 2015, the rate was better off at 19.4 per cent 11 . North-west is ranked highest in the occurrence of malnutrition with 55%; followed by North-east with 42%, while North Central came third with 29%. South east and south are 16% and 18% respectively. Lastly, 22% are in the South-west 9 . This trend has been associated with high rates of illness and poor nutrition among children under 2years, lack of access to health, water and sanitation, armed conflict particularly in the North East, irregular rainfall, high employment and poverty 7 , 10 . It was also observed that the likelihood of suffering from the different deficit varies between children living in different neighborhoods, which might be explained by differences in income, access to food and water supply 12 . It also cut across age, as double burden of over-nutrition (overweight and obesity) and under-nutrition (stunting and wasting) among adolescents in Nigeria 13 . It is as result of the above that this study is conceived with aim of determining the impact of malnutrition on the rural infants, with Kuje Area Council, Federal Capital Territory-Nigeria as a case study. Hi: There is significant relationship between Malnutrition and rural infants in Kuje Area Council, Federal Capital Territory, Nigeria. Kuje Area Council is one of the local council areas of Federal Capital Territory (FCT) of Nigeria. It has a land area of about 2,086Km2 and it is located between latitude 6025’ and 7045’N and longitude8025’and 903’E of the Greenwich. Figure 1 Map of Kuje Area Council, FCT-Nigeria. Source: UniAbuja GIS Lab, 2018. It is bounded in the West by Gwagwalada Area Council and in the East by Nassarawa State. It shares boundary with Abuja Municipal Area Council in the North –East and Abaji Area Council to the South-West. 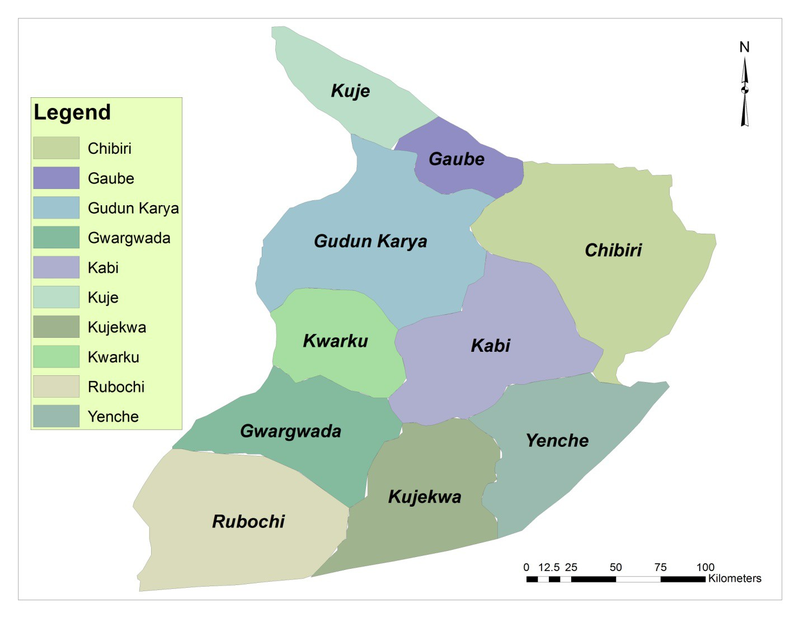 Kuje Area Council has a population of 97,233 people (Federal Government of Nigeria Official Gazette, 2007). It is made up three major tribes with Gwaris constituting about 60% ,while Gede and Bassa constitute about 30% and 7% in that order. The remaining 3% is made up of the immigrants, who are mostly economic migrants. Farming is the major occupation in the study area and the people are mostly settled in the rural areas, which has influenced their socio-economic activities. The informal activities in the area are small, but are expanding of late as a result of influx of the immigrants into the area. Majority of men in this area are polygamists. This may be due to the nature of their occupation as peasant farmers; a labour inclined occupation which can only be available through many children. Kuje Area Council falls within the Nigeria geo-political zone where educational attainment for male and female is 25.3% and 39% respectively 14 . The data used in this study were obtained from primary and secondary sources. The secondary source included National Population Commission (NPC) publications and maps while the primary sources involved were questionnaire and in-depth-interview (IDI). In obtaining relevant data for the study, purposive and random sampling techniques were adopted. In obtaining the data, 50.0% of all the settlements in each ward, constituting the sampled settlements. The uniformity in the choice of 50.0% is as a result of variation in the number of settlements per ward so as to ensure proportional coverage of the study area Table 1 . It is also to avoid large data which may ensure if a larger sample size is involved. Sources: National Population Commission (1991). The respondents (Household heads) were estimated using National Population Commission (1991) estimated mean household for each settlement in Federal Capital Territory (as at 1991) put at 4.2. The use of 1991 census data is informed by the fact that, there is no current population data that disaggregate into localities. The profile of respondents in Table 2 shows that, 70.0% are male, while the remaining 30.0% female. This may be so, because of the nature of Africa society where discussion that has to with family, lies with the head, who are mostly men. Furthermore, 90.0% of the respondents are married, while 10.0% are spinsters. The married are able to give detail knowledge of what they understand as family planning and it should be encouraged or not. .In the same vein, majority of the respondents are farmers. Farmers constitute largest of the respondents with 80.0%, while civil service and others are 20.0%. The others in this study include traders, artisans and unemployed. About 40.0% of the respondents have formal education, and 60.0% do not have formal education. This level of education may be adduced as a key factor in family size in the study area. The same table reveals that, 6.3% of the respondents has the lowest family size of between 1and 3 persons, while 33.2% of the respondents has the largest family size of over 9 persons. Lastly, 37.5% and 32.5% of respondents are Christians and Muslim respectively, while African Traditional Religion is.30.0%. Looking at it from the angle of education, the correlation co-efficient on Table 3 revealed that there is an average relationship between malnutrition and rural infants in Kuje Area Council, Federal Capital Territory, Nigeria. This is because the p-value of .008 < 0.05 level of significance at a correlation level of 0.520 at 22 df. The alternative hypothesis which states that, there is significant relationship between malnutrition and infants of the study area” is being accepted. Table 4 The Result of Correlation Analysis on malnutrition and infants in Kuje Area Council, Federal Capital Territory, Nigeria. The correlation co-efficient on Table 4 revealed that there is a weak relationship between malnutrition and rural infants’ body weight in Kuje Area Council, Federal Capital Territory, Nigeria. This because the p-value of .174 > 0.05 level of significance at a correlation level of 0.289 at 22 df. The null hyphosesis that states that, “there is significant relationship between malnutrition and infants’ weight of the study area” is being accepted. This infers that, malnutrition as a common phenomenon in the study area with its attendant impact on the infants’ development; this may be associated with factors discussed earlier in this study. This is similar to the submission of Walson and Berkley (2018) 15 who opined that, almost half of all childhood deaths worldwide occur in children with malnutrition, predominantly in Sub-Saharan Africa and South Asia. Figure 2 Types of Food in the Rural Areas of Kuje Area Council, FCT-Nigeria Source: Field Survey, 2018. From Figure 2 , 20.0% of the respondents affirmed that tuber/roots constitute their food; these are made up of yam, cassava, potatoes, water yam among others and mostly grown on subsistence scale; the labour are provided by members of the family and through self-help. In an interview, an indigene affirmed that: Apart from suitable soil and climate that suites the production of these foods, we obtain parts of our foods from tubers/roots; this partly because, producing them is cheap and is labour intensive, which is easily available in our children and wives (IDI, Kwakwu, Kwakwu Ward,2018). In the same vein, 55% of the respondents confirmed that cereals form the major food of the study area and it supplies about 80% of the energy requirements. The cereals include maize, guinea corn and millet, all which constitute a major food amongst the rural populace of the study area. Cereals are mostly carbohydrate laden and this is contrary to World Health Organization- WHO (2011) 16 recommendations of meat, poultry, fish or eggs as often as possible. Suffice to add that, consumption of cereals is not limited by age; for infants of weaning age, cereals are converted to local consumables of pap, akamu, ogi, or koko for their consumption 17 . Furthermore, 15% of the respondents opined that, vegetables form part of supplement to cereal or tubers/roots of the rural populace. In an interview, a resident of the area opined that: Vegetables constitute a major component of our food; in cases where we cannot afford Meat, fish and ski (Considered nutritious), we use vegetable as supplements. These are cheap and accessible the year round (IDI,Gwarigwada War,2018) . Lastly, 10% of the respondents affirmed that, there are other spices such as dawa dawa (Produced from Locust bean), potash among others. Despite this World Food Programme (2017) 18 submitted that, of about 800 million undernourished, 780 million are in low income countries, especially in sub-Saharan Africa and South Asia. Accessibility to adequate food varies from one area to another, resulting in malnutrition. Malnutrition is described as a condition that results from eating a diet in which one or more nutrients are either not enough or are too much such that the diet causes health problems. This has been linked to lack of balanced diets, indigestible and harmful diet, lack of regulated diet, environment among other. Rural areas remain central to the development of any nation; it forms economic base of the developing countries where foods are grown and place of abode to many. This study reveals that there are links between malnutrition and infants in the rural areas with its attendance effects on the study area. In the light of the above, the study identifies Poor diet as a problem in every country, it therefore recommends food security and by extension adequate of same in the rural areas. 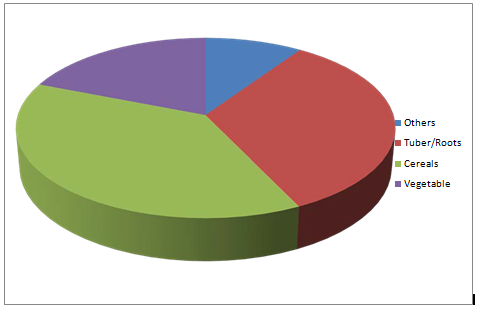 Nigeria National Population Commission and ICF International Health Survey Nigeria Demographic. 2013. The 2008 Nigeria Demographic and Health Survey, ICF Macro USA: National Population Commission; 2009. Black et al. () Maternal and Child Undernutrition and Overweight in Low-Income and Middle- Income Countries. Nigeria Federal Ministry of Health, Family Health Department (2014). Health Sector Component of National Food and Nutrition Policy: National Strategic Plan of Action for Nutrition. Abuja, Nigeria: Federal Ministry of Health. Griffiths P, Madise N, Whitworth A, Matthews Z. (2004) A Tale of two Continents: A Multilevel Comparison of the Determinants of Child Nutritional Status from Selected African and Indian Regions. Health Place. 2(10):183-99. Kennedy G, Nantel G, Brouwer ID, and Kok FJ (2006) Does Living in an Urban Environment Confer Advantages for Childhood Nutritional Status? Analysis of Disparities in Nutritional Status by Wealth and Residence in Angola, Central African Republic and Senegal. Public Health Nutr.9 (2):187- 93. King J and Ashworth A. (1987) Changes in infant feeding practices in Nigeria: An Historical Review. Occasional Paper No. 9. London: Centre for Human Nutrition, London School of Hygiene and Tropical Medicine. National Population Commission (2009) The 2008 Nigeria Demographic and Health Survey, ICF Macro, USA. United Nations Children Emergency Fund (2013) The Achievable Imperative for Global Progress. New York. Retrieved from http://www.unicef. org/gambia/Improving_Child_ Nutrition_-_the_achievable_ imperative_for_global_progress.